I'm a gamer. And if you're reading this site, you're probably one, too. Gamers like, well, games, and our games of choice now are video games. But gamers, as a breed, are nothing new. Recent archaeological findings continue to support just that. National Geographic reports that preliminary research has turned up prehistoric dice boards in Mesoamerica (an area from Mexico to Costa Rica) that date back as far as 5,000 years ago. Yes, that means there were gamers even in prehistoric times, but sadly, they were not reading Kotaku. Hole punctures laid out in c-shapes in clay floors were discovered at the Tlacuachero archaeological site in Mexico. Archaeologist Barbara Voorhies first found the markings in 1988, but wasn't then able to pin down their meaning. After finding nine more c-shaped arcs dating from 4,300 years ago in 2009, Voorhies began unearthing what they meant. The archaeologist discovered that these markings were similar to native gaming boards used by the Aztec in the 1500s and the Tarahumara (above) in the 1800s. "There's no absolute proof that my interpretation of these strange features [is right], but it's a very strong analogy, and that's about as good as it gets for archaeology," Professor Voorhies told National Geographic. Other researchers agree that these boards are the earliest evidence of gaming in the Americas. If the game was in fact similar to the 19th century versions, players would try to move their marker after rolling some sort of die. The first player to reach the opposite side would apparently win. 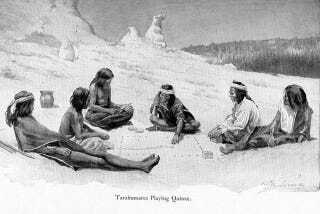 Games, of course, weren't only played in Mesoamerica in ancient times. Senet and Mehen were enjoyed by gamers in Egypt. But in Mesoamerica, the oldest game was previously believed to be a ball court that dates from 3,600 years ago.